As soon as I see that little silver ball, I can immediately recall Darth Vadar's theme music. That's no moon, that's the Death Star. I've been contemplating what my special dessert would be on May The 4th Be With You. Decorated cookies have been the treats for the last three consecutive years, I wanted to do something a bit different. 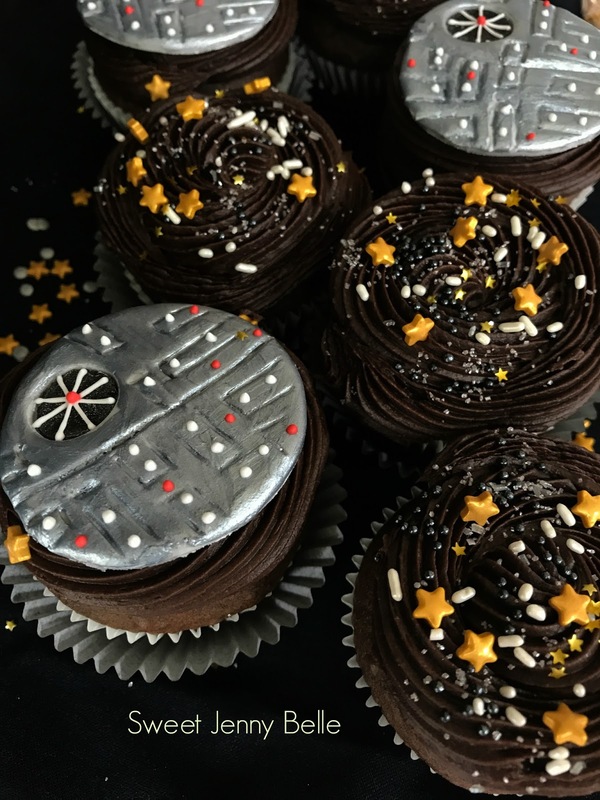 I was inspired by my best friend, Karen's Death Star Cupcakes, but of course want to put my own spin on it. I have a little experience with fondant and need to improve my skills. Cupcakes seemed a lot less intimidating than a whole cake! If you are new to fondant as well, I think you will find that this an ideal project. When you begin, you will need to condition your fondant. While wearing gloves (fondant will pick up every bit of dust or color on your hands!) 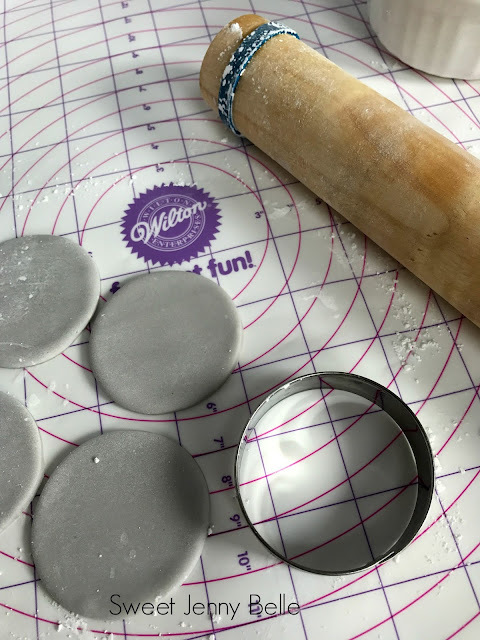 roll the fondant until it is soft and pliable. If you find your fondant is too soft, knead in a small bit of powder sugar. You can also add tylose to stiffen it, but be aware that it will become permanently more brittle and not the tastiest. 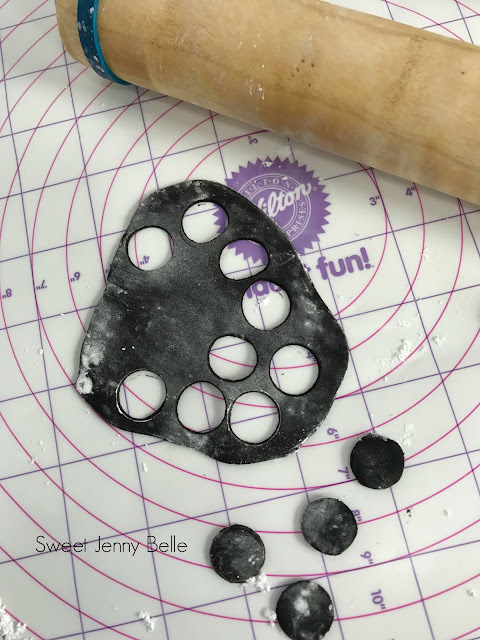 Roll out your black fondant to 1/8" thick. I use fondant roller rings on my small pin to make sure that it is consistent. If your fondant, mat or pin get sticky, sprinkle more powder sugar. Take a small icing tip - any size is ok, and cut out small circles using the base of the tip. Set these pieces aside on a pan to stiffen. 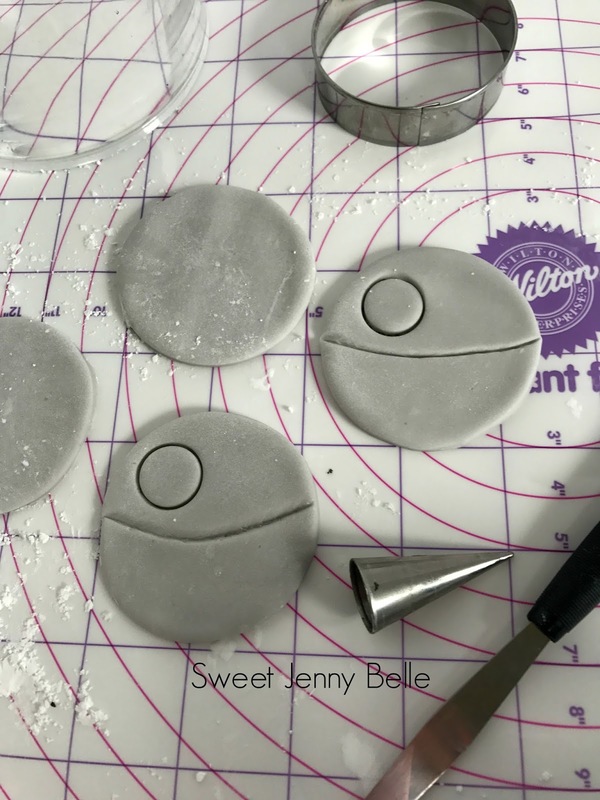 Now roll out your grey fondant to 1/4" thick - these are thicker because they are the base piece and will be resting on the cupcake. 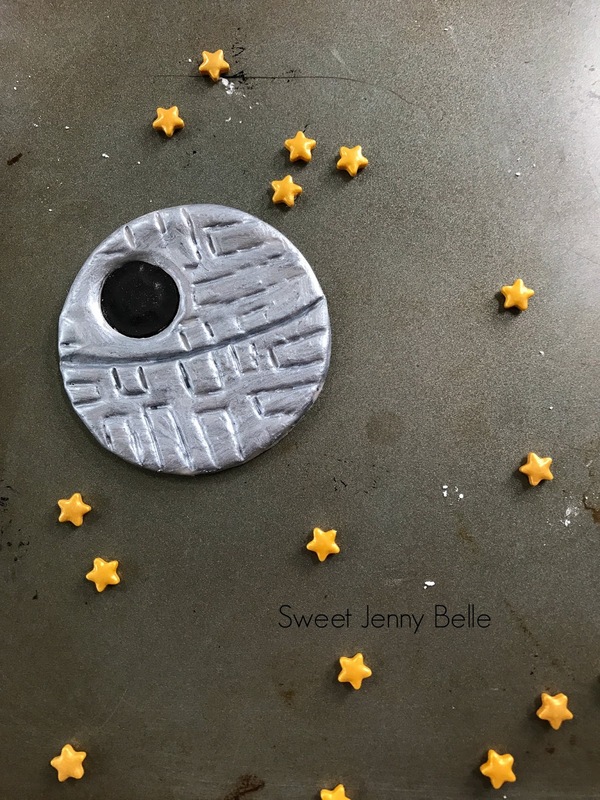 Cut out large circles with the 2 1/2" cookie cutter, these will be the Death Star. I start the design of my Death Star by first creating the focal center line. It is a curved line since it is supposed to resemble a sphere. 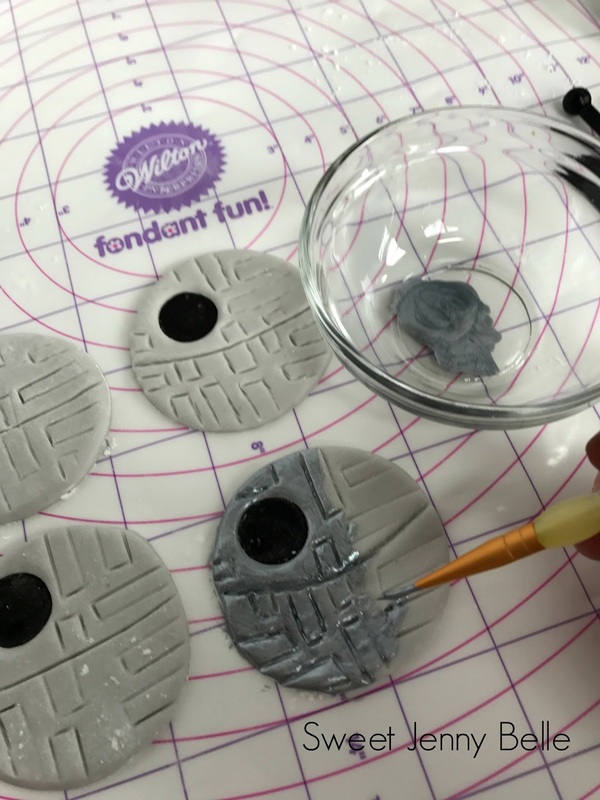 You can create the line lightly with a fondant tool until it's perfect. Then go back and make the line very obvious, but do not cut the fondant into two pieces. 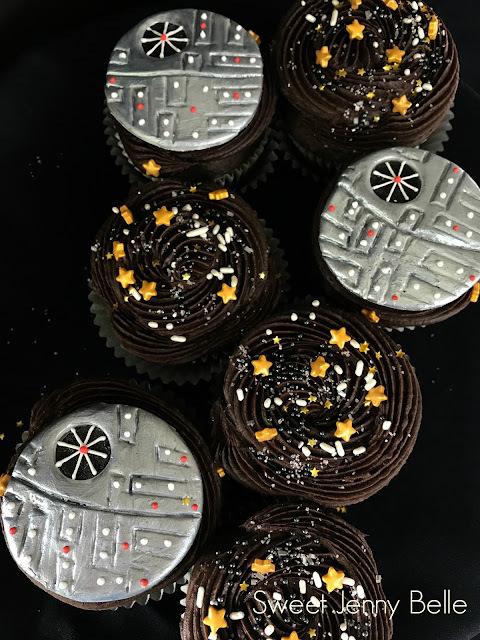 Next with the same icing tip, cut out a small circle on the left side of the top part of the Death Star. Create lines of the death star with one of your preferred fondant tools. They are open rectangles of various shapes and orientation. You want the lines to be prominent, but not cut into the fondant all the way. You could also use a toothpick to create these lines. Now that Death Star needs to become shiny - so shiny! You can leave it grey if you like, but I wanted some metallic shine on those babies. There are a number of silver edible paints on the market, Wilton also has an edible silver spray located on the baking aisle of most craft stores. If you do use the spray paint, spray first and then add the black dot or it will all be silver. Isn't it fun?! You could leave it just like this. 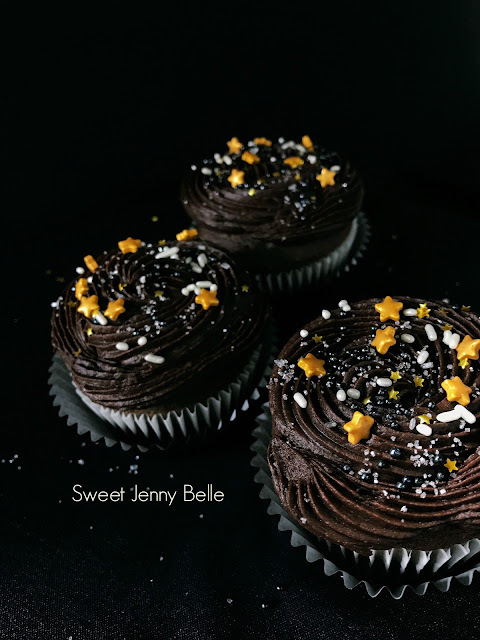 It would be a perfect edible decoration for your dark chocolate cupcakes. However, if you enjoy working with royal icing or want to try a bit, I add a few more details in red and white. I have a large royal icing recipe here, but I have also used this small batch recipe and it would be perfect for this project. Using the white icing in a no tip frosting bag or even a Ziploc, add a few lines on the black hole of the Death Star and a few white dots to resemble lights. Add just a few more dots of red in the center of the black hole and surrounding areas. 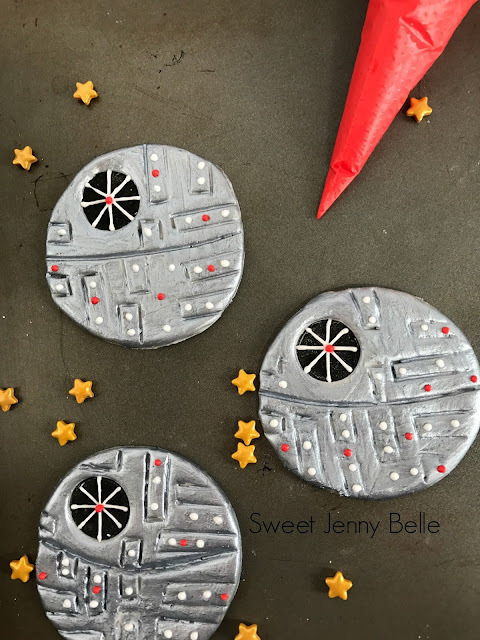 Your menacing Death Star is ready to be gobbled down by your Rebel Scum while you watch the movies at home. 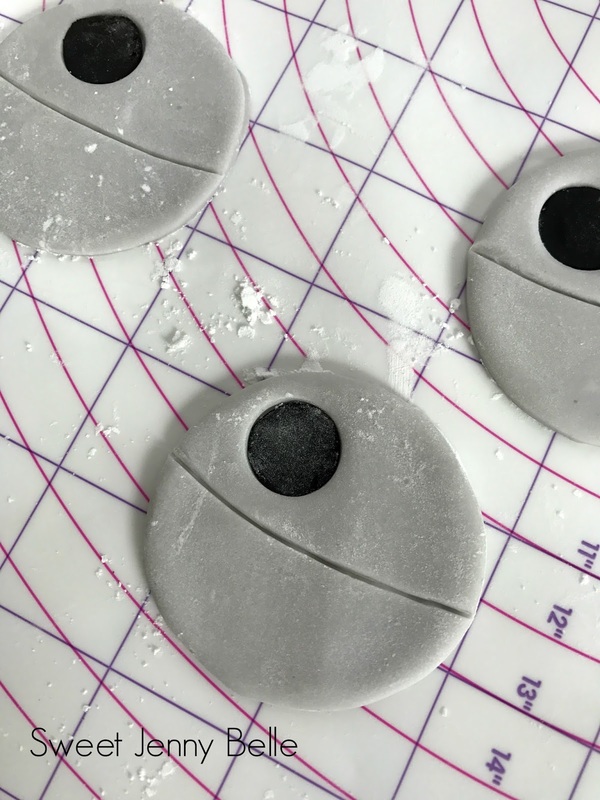 It isn't hard or intimidating - it may even peak your fondant interest as it did mine! Want to see me create the topper in a video? There is fast paced one above - just click the picture. If you have any questions, be sure to email me! You can create these toppers days in advance. Store them in a cool, dry and dark spot - placed on a cookie sheet in the cold oven is perfect. Sunlight will alter the colors of your fondant quicker than you will imagine. Place toppers on cupcakes right before serving. The yummy oddles of buttercream underneath will soften the fondant and if put on too soon, they will become limp. 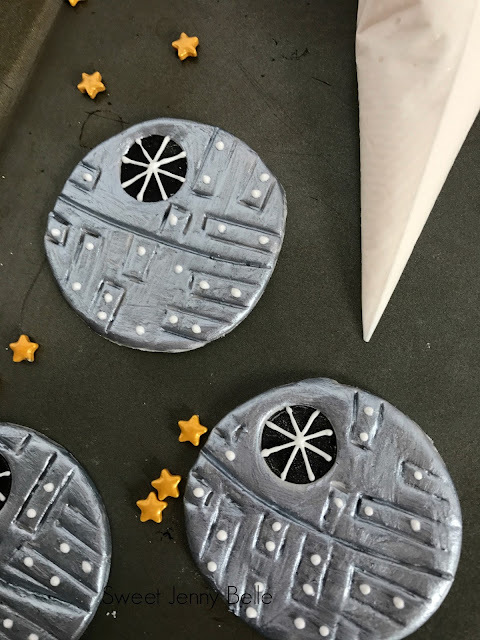 Don't forget to Pin this post - you know you are going to want to create these for your next Star Wars party! So much delicious fun..